Well, here I am, on the verge of the next big step in my life's journey, in the midst of a move to Sydney. 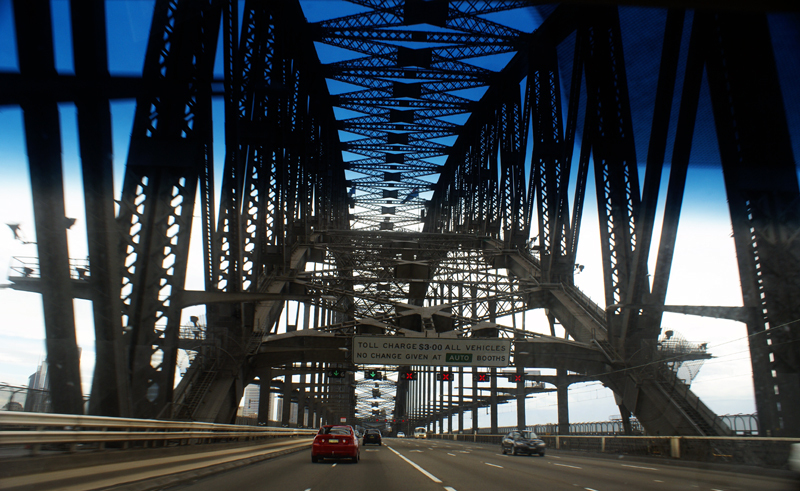 Yesterday, the removalists came and packed all our worldly belongings perfectly sardine-like into the back of a truck, and carted half to storage with the other half going to Sydney. Downscaling from a 4 bedroom house to a 2 bedroom apartment is no mean feat for an arty designer and her gadget-mad partner. Sacrifices had to be made by both, i.e. I get to take only 3 small boxes of books to Sydney (out of 18 boxes!!!) and DD stripped down his media equipment to the bare essentials and the kitchen table will now have to double as his office. 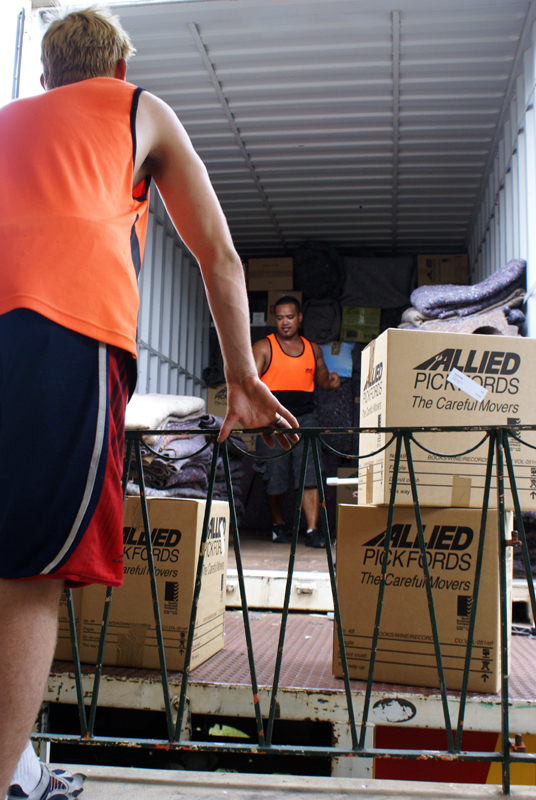 All our "housey" stuff like garden equipment and tools all went straight to storage. It's going to be strange to go from having ALL of my stuff in one place and in easy reach, to travelling "light" with only half of it, and the frustrations that will inevitably follow. But with worldly travel planned for the next few years, it's going to have to be something to get used to, so I may as well practice with this Sydney move. One thing's for certain, moving house sure makes you get through a lot of the tasks that would otherwise remain uncompleted - sorting piles of paperwork, discarding superfluous 'stuff' (yay for garage sales and Ebay), refining your belongings to what is truly essential... It's just the rest of it that's such a traumatic pain in the arse. Stressful and exhausting. But now half the pain has been survived, just the finding a place in Sydney and the unpacking to go, and most of that will be up to DD since he arrives in Sydney next week, 4 weeks before I am due to head down there. For now, I am tying up loose ends in Bris, finishing up at work, updating my design folio ready for the search for a new job in Sydney, and making sure that our new tenants are settling in ok and everything's fine with KG. A photo a day? Yeh sure, no problem. I'm always taking photos so it'll be a cinch... Or so I thought. 2 weeks into the new year, and 13 photos later (missed a day already! ), and I'm beginning to appreciate the amount of discipline required to motivate oneself to take a photo every single day. But that is the premise of the Daily Photo challenge, and I'm soooo up for it. And so it would appear are numerous + varied friends of mine - about a dozen or so of us last time I counted. The plan is for each of us to continue to take our daily photos throughout 2007, and about this time next year hold some sort of an exhibition of the photos, somehow, somewhere in Brisbane. I've started compiling my photos into the 'Daily Photo' album (see the column on the right), with the grand idea that I will upload the week's photos every Sunday evening. All photos even come with a bit of a spiel, which not only helps inform unwitting viewers, it also helps to supplement my often pathetically bad memory. Feel free to have a look through the Daily Photo album at any time throughout this year, you'll be sure to get a sneak peek in to the life and times of Shelbyville. Others currently undertaking this challenge include DD, Georgie, Jay Dee, Jo, Esther, Ashley, Cath, Charlotte, Rob, Michelle K, Jarren (and some have even published photos online already...click the link to see). If anyone else is interested in joining the challenge, we'd love you to be a part of it, and it doesn't matter if you're starting late. If you could let me know you want to be involved (exhibition optional), we can sort out a way to share around the weblinks, so everyone is able to view everyone else's daily photos as we go. Yes, yes, yes, it's that time of year again, when I set myself some fresh goals for the year ahead - 10 brand new resolutions - a list of things I'd like to achieve within the next 12 months. 1. Complete the remaining goals from 2006 (these include: finish my 12 oil paintings; start my clothing label 'Hem'; publish a photography spread in Desktop; and complete Majellen #2 'Laundromatic'). 2. Get Photography Adventure #3 to happen, + hold its resultant exhibition before the end of the year. 3. Discover a new city (more about this later). 4. Daily Photo - take a photo for every single day of this year, regularly upload them to Shelbyville, and at the year's end, meet up with all my friends who are also undertaking this challenge to view and compare photos (maybe even an exhibition of sorts...). 6. Write + design my 'Photography Adventures' book. 7. Create an online store for selling my books/handmade items/artworks/designs/etc. 8. 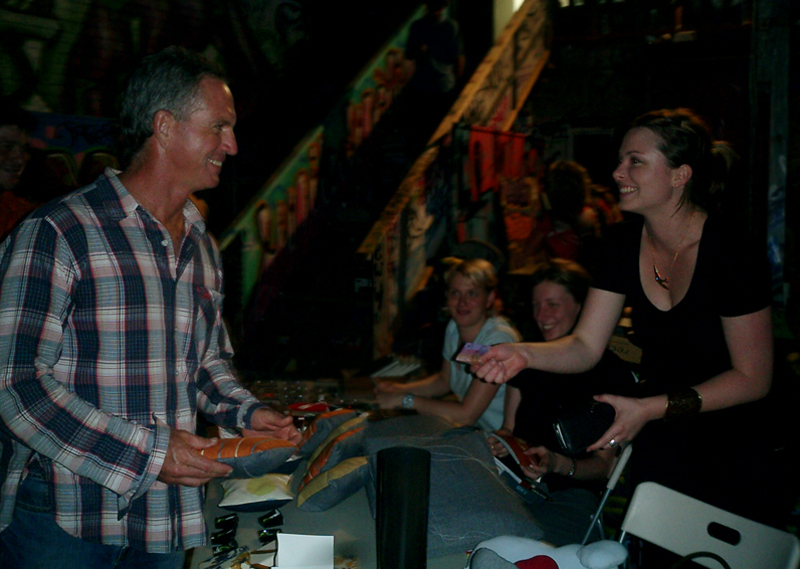 Dedicate time to giving something back to the community, creatively. Well that should give me some big, juicy goals to sink my teeth into this year, with something to aspire to in all the big areas of my life...career, finances, personal projects, family + friends, travel, creativity, community. ^ These guys on the left were the wierdest thing I saw at Woodford this year (and that's saying something). A puppetry act with a difference (they used kitchen utensils and food to act out the drama). In the middle is Heidi Hibberd (awesome awesome awesome singer/songwriter, and funny as hell. Can't wait til she releases an album or EP or something...). ^ A myriad of interesting details that catch the observant eye. ^ ...and catching DD on film too. ^ Some of DD's awesome long-exposure shots of a neighbouring firetwirler at our campsite. Gotta love the Sonycam. 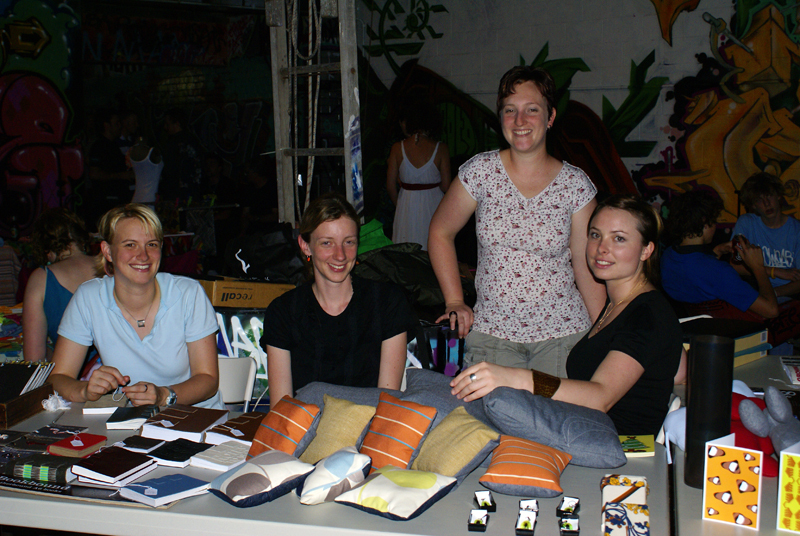 Here we are, 4 creative little things peddling our wares at a 'night market' as part of an art exhibition opening at Jugglers, one of Brisbane's best galleries for young + emerging artists. It was a super successful evening for all of us - we sold lots, talked to many many people, met some new friends, and just had a good, old-fashioned fun night. 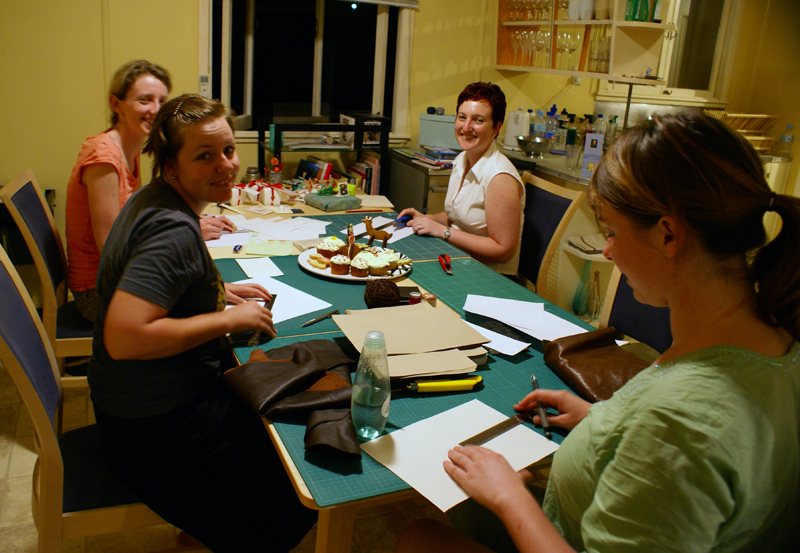 This photo was taken on the night we all got together at my place for a bit of an impromptu bookbinding lesson. 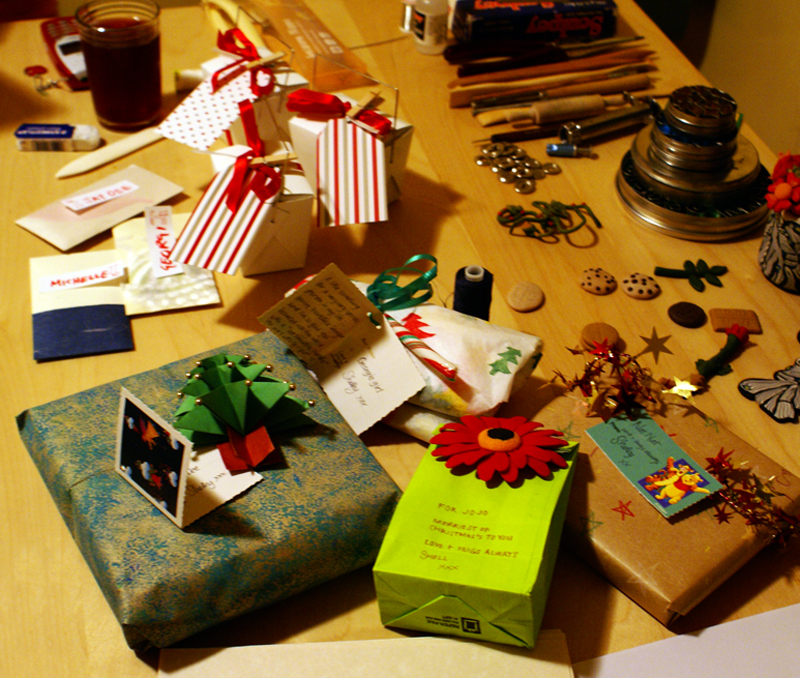 Sitting around the kitchen table, making books from scratch, eating JD's most incredibly delicious homebaked cookies + cakes, and chatting incessantly (not to mention the presents)...I can't imagine a happier way to spend an evening! Check out those cookies!!! 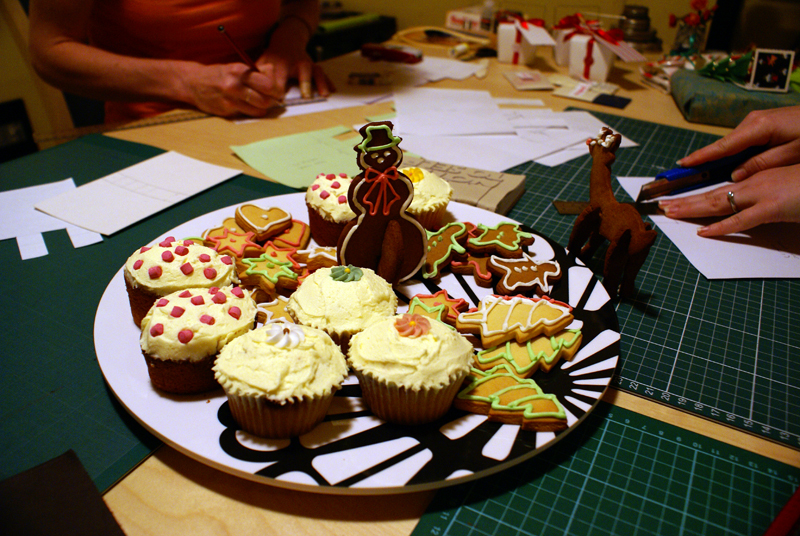 Have you ever seen 3-D gingerbread before, because I sure as heck hadn't!! And JD, you're welcome to bring those cakes over any time you visit...Mmmm. After all of December's bookmaking, I had lots of hand-bound books ready for giving to friends as xmas presents, and plenty left over for retailing as well. Just before Christmas I took in an armful of books (A5, A6, and A7 sized) to Craft Queensland in the hope of selling some books to Brisbane's craft-appreciative population...so if you're ever down on Brunswick St in the Valley, be sure to drop in to the Craft Queensland store for a sticky-beak. Just prior to xmas I was also happy to sell a number of books to friends and market-visiting people, so to all the lucky ones out there who are now the proud owners of their very own 'Bookbound' book, I hope you are enjoying it and not hiding it away in some cupboard, never to be utilised!! (because that's soooo naughty). And still so much to tell you about December, but I will have to pick this up again tomorrow night, as there is sleep needing to be sought.